It is the Land of the Thunder Dragon, a creature of Teutonic mythology, usually represented as breathing fire and having a reptilian body and sometimes wings. In fact this dragon is the symbol of their National Flag. Bhutan lies in the eastern Himalayas, sandwiched between China and India. Inspite of geographical limitations being a landlocked country, Bhutan's people are the world's happiest people. It is the country with least carbon dioxide deposits in the atmosphere. It has a great legacy of planting a thousand saplings by every pregnant woman before her delivery. Perhaps, this idea is driven by environmental concerns with an eye to have more greenery to make their country the best liveable place on Earth. Happiness is synonymous with Bhutan. 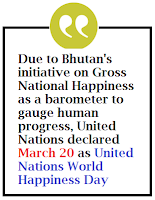 The unofficial Reference Guide Wikipedia says that in 1972, Bhutan's fourth king Jigme Singye Wangchuck declared that "Gross National Happiness is more important than Gross national Product''. In fact this concept is based on four pillars: sustainable development, preservation and promotion of culture, conservation of the environment and good governance. 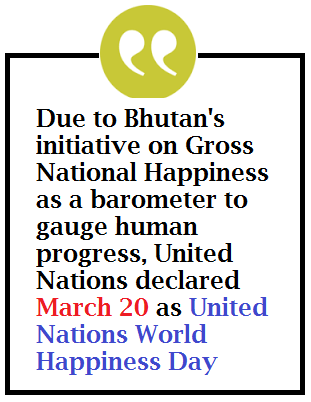 To measure progress according to these pillars, Bhutan adopted a development index in 2008 to reflect GNH values, set as benchmarks to track policies and performance of the countries. This index takes into account the GDP per capita, life expectancy, social support and freedom to make life choices as indicators of happiness. In 2016 report, Bhutan's rank is at a comfortable 84, out of 157 countries. Where as India's rank is at 118, way behind neighbouring countries like China which is pegged at 83, Pakistan 92, and Bangladesh at 110. The moral of the story is, India must learn a lot from this tiny Himalayan country ! Also read this interesting story : Why Sports is neglected in India ? Good writeup on Bhutan.. thanks for sharing! !